The importance of life-long relationships was stressed by several speakers at the annual graduate/faculty prayer breakfast May 17 that opened Samford University spring commencement weekend. "The most important thing you will have is friendships," said Jay Gilmer, a graduating senior from Selma, Ala. "Samford hasn't always been exactly like I thought it would be. But, reflecting on it, I have seen the amazing way the Lord has used friends in my life to help me grow." Referring both to peers and faculty, Gilmer talked about the lifetime influence others have had. "I am honored to be at a place with such high caliber people who have wanted to challenge me," he said. "This is not an ending for those relationships but a catalyst for you to move forward in the next season of life." Chemistry professor Denise Gregory used the words of the 1970s Carole King hit song "You've Got a Friend" to "adequately reflect what I want to say" about the importance of lasting relationships. Gregory noted that many times college relationships turn into lifelong friendships. "People come in and out of your life, but true friends remain for a lifetime," she said. "It truly is important to build lasting relationships with people who share the same values that you do," Gregory told the audience of about 300. "As you move into the next phase of your life, I encourage you to maintain relationship that you have created. Make new friends, but keep those that you already have." Gregory encouraged the graduates to "Cherish this moment. Cherish your friendships. Cherish your Samford." Faculty member Chuck Stokes also invoked popular culture in his remarks. Referencing a line from the Star Trek movies, he called faith "the final frontier for the class of 2013." Asking the students to reflect on how their faith had changed while at Samford, he said that he was 100 percent certain that their faith was "not finished." Noting that many college students "like to put their faith in a lock box for their college years," Stokes said Samford was a different kind of place because "we encourage you to put your faith into action. The God of our faith is more magnificent than we can imagine. You can never outgrow God." Caitlin Morris, a graduating senior from Columbus, Ga., also stressed the role that Samford had played in her faith formation. "It is a place where I have been pushed toward the Lord, not away from the Lord," she said. "So many opportunities were provided for me to grow. My prayer is that we will use what we have learned at Samford and grow from there. We have the foundation." Scholarly opportunities as part of that foundation were emphasized by graduating senior Chenelle Terry of Antioch, Tenn.
"As mature scholars, we have learned to have a memorable college experience while keeping balance in our lives," said Terry, who has been a member of Samford's track and field team. "Samford has given me an amazing opportunity to improve as a student and as an individual. "We can take pride in knowing that we have earned a degree from Samford. We can take what we have learned beyond the gates and make a difference in the world." Jeremy Thornton, a faculty member in Samford's Brock School of Business, compared the formulation of scholarly ideas with the growth of plans. "We, this greenhouse of ideas, set ourselves on these [scholarly] tasks," Thornton said. "We watch and wait to see if the ideas take root. Ultimately, we show new seeds, sometimes deliberately, sometimes by accident." In his concluding remarks, Samford President Andrew Westmoreland said the graduates might look upon their education as a business transaction. "You paid your money, and we delivered a product. Today, we fulfill that business transaction. "But, speaking for the [faculty] in this room, this is about as far from a business transaction as you can get. Every year at this time we celebrate all that you have accomplished, and we grieve a little because you are leaving. But, we know that God has prepared you to go out into the world to do great things. And, our great joy will be seeing all that you do in the years in ahead." 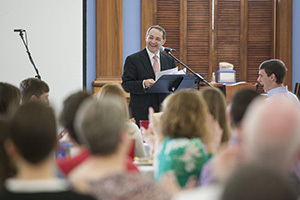 This was the fourth year for the prayer breakfast, which Westmoreland described as a "new, cherished tradition" for Samford.